Call of Duty: WWII mostly focuses on large battles and explosive confrontations, but the game’s best mission is quiet, intimate, and subtle. Call of Duty: WWII’s narrative focuses on the US Army’s 1st Infantry Division, centering on major battles like the Invasion of Normandy and The Battle of the Bulge. These levels feel as loud and chaotic as any other Call of Duty level. Players fend off tanks, use flamethrowers to clear out bunkers, and provide covering fire as a sniper. A squad mechanic that grants special powers and items as bonuses from fellow soldiers attempts to create emotional stakes but stumbles in execution. 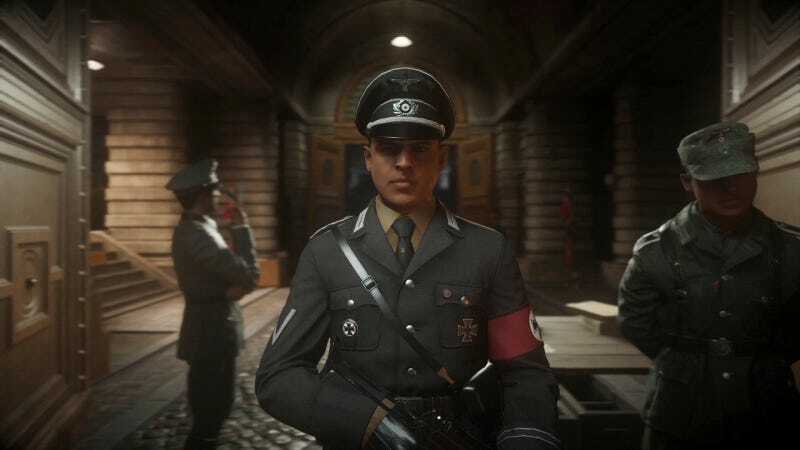 At one point, Call of Duty: WWII moves away from the 1st Infantry Division and places the player into the shoes of Camille “Rousseau” Denis, a French resistance fighter. The mission is called Liberation. Rousseau and a British special agent are sent to a Parisian garrison to sabotage the outpost before Allied forces arrive to take the city. Rousseau poses as a Nazi aide in order to infiltrate the headquarters. This sequence eschews set piece gun battles for an experience more like a narrative game. Rousseau must meet a German contact to receive a briefcase full of bombs. The initial part of the mission has her searching the embassy for her collaborator. Often, she is stopped by Nazi officers and asked questions; the answers to these questions are found in identification papers that the player can read at any time. Players must remember their fake name, birthplace, superior officer, and more. A wrong answers means death. The risk of sudden death, alone and surrounded by the enemy, gives the mission a tension that WWII’s other levels never manage to find. Part of what makes Rousseau’s mission compelling is that there are clear personal stakes as well. While the main game tries to create this through the squad mechanics, Rousseau’s scenario is less abstract. One of the Nazis in the headquarters is Major General Heinrich, an SS officer responsible for the death of Rousseau’s family. While Rousseau is attempting to pass through his office to gain access to the roof, Heinrich enters, and the two engage in a dialog sequence in which the player must answer multiple questions correctly. It’s a trick—Heinrich recognized Rousseau from the start. The ramping tension finally bursts in a struggle, and Rousseau stabs Heinrich to death. It is an emotional release unlike anything else in the game. The rest of the game’s villains are nameless soldiers mowed down by the dozens. Rousseu’s confrontation is personal, with genuine emotion that feels rare in an otherwise sterile game. Liberation also handles stealth better than missions featuring the 1st Infantry Division and protagonist Red Daniels. Where those missions manage to wedge minor moments of stealth between massive battles, Liberation is built for stealth. It includes an extended sequence in which Rousseau ducks and weaves her way through the headquarters’ courtyard to plant the bombs she received from her contact. The courtyard is a tangled web of boxes, vehicles, and scaffolds. It’s a courtyard built for stabbing Nazis, and one of the game’s better-designed locations. Unfortunately, nothing good lasts forever. The second half of the mission snaps back to Daniels and the 1st as they lead the charge to liberate the city. Historically, the 1st Infantry Division was not involved in the liberation of Paris. Call of Duty: WWII contorts and twists history to draw them back into the plot, breaking away from a unique and interesting mission and back into the realms of generic first person shooting. But for a brief moment, WWII almost becomes an entirely different game. I want to play more of that game, learning about the French Resistance and other lesser known stories that games haven’t really explored. Liberation is Call of Duty: WWII’s finest moment and it pulls it off, ironically, by moving away from the epic battles and set piece the series is known for.